When you are moving you are moving your office, this could mean one thing only – that your company is going through changes. It does not matter whether it is a big change, or a small change, a positive one or a negative, you and your employees would feel much better if the physical relocation of your office space – computers and other equipment, archives, expensive office furniture and decorative items – is carried out by a contractor that knows what he is doing and is able to complete the task in the shortest time-span possible and up to all quality standards. We are such a contractor and we would be more than happy to be at your service. 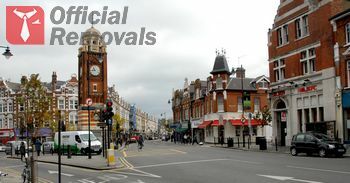 With many years under our belts providing top quality office removals in Crouch End, we have a solid reputation among the local business community of being a responsible, energetic and dependable team of expert removalists delivering Crouch End office removals of unmatched quality and who can always be counted on to tackle even the largest and most complex tasks our clients have for us. Tells us what you need to be done and we guarantee that we will do it up to all your expectations. It is a matter of professional honor for us to do the job according to your specific requirements, so if you have any questions or special needs, please do not hesitate to inform us about them immediately. Our friendly customer service specialists have a deep working knowledge of the field and they will help you sort out exactly what kind of service you need. They will provide you with a free quote and draft an individual plan for your removal which our removal experts will expand and complete, so that your upcoming office relocation is approached in the best way possible. For quotes, booking and any questions you might have, call us on the numbers provided on this website or write us in the online contact form. There would be always someone to answer the phone or check the e-mail, so you can rely on us for a prompt and informative answer.